Bonus Q-56 Which of the following represents the most typical description of a Kaposi’s sarcoma lesion? Bonus Q-116 The posterior pituitary secretes arginine vasopressin (antidiuretic hormone) under which of the following stressors? Dr.Rohit Choudhary: Guidance of DAMS supports my family and my luck. Dr.Rohit Choudhary: Everyone glade and happy enjoy my success. 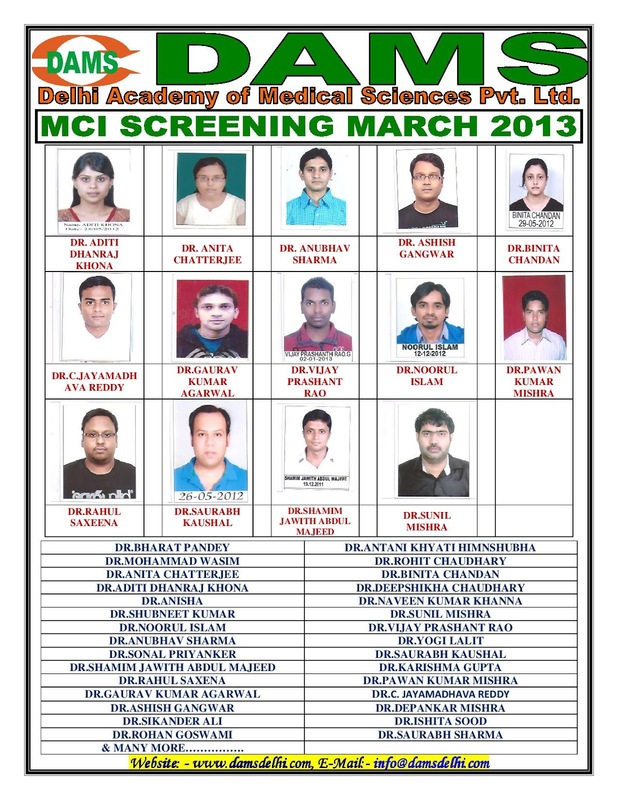 Dr.Rohit Choudhary: DAMS full team. Ans. Every golden point of DAMS and question papers Medicine full notes. Dr.Rohit Choudhary: Every question paper which giving by DAMS every year paper from KV Book, Accross, DNB question. Dr.Rohit Choudhary: Motivation of DAMS team which given by every teacher and Specially Sumer Sir. Dr.Rohit Choudhary: I think intensive smartly important and hot topic any repetition again. Dr.Rohit Choudhary: Medicine, PSM, Surgery, Radio, OBG. Dr.Rohit Choudhary: First I done selective ad confident question in every paper. Dr.Noorul Islam: First thanks to GOD, DAMS notes and regular study. Dr.Noorul Islam: Without family support it won’t be possible. Dr.Noorul Islam: Dr. Sumer Sir, Physio Mam. Dr.Noorul Islam: Only DAMS notes and previous MCI question. Dr.Noorul Islam: DAMS is everything in my study to pass MCI. Dr.Noorul Islam: Selective and intensive study, revision and Pre-revision. Dr.Noorul Islam: PSM, OBG, MED, Opthal, Pharma, Bio All short subject. Dr.Noorul Islam: I attempt all questions you have to attempt all questions, because there is no negative marking. Dr.Noorul Islam: I want to be good MS Ortho. Dear friends I am happy to share that DAMS has been featured on The Franchising World-Education Special as one of the Top 35 education business ideas in India, based on their third party surveys. Thank you all for your kind support and wishes. Dr. Ashish Singh: Blessing of God, Result of study, DAMS notes, academic faculty of DAMS. Dr. Ashish Singh: They give up me blessing for success in the life. Dr. Ashish Singh: Dr.Sumer Sethi, Patho Mam, OBG Mam, Opthal Mam all faculties of DAMS. Dr. Ashish Singh: No, I have didn’t doubt in my study. Faculties of DAMS are very good. Dr. Ashish Singh: Surgery, OBS, Opthal, Patho, Radio, Ortho & Dermat. Dr. Ashish Singh: K.V Kamal, Vivek Jain, (Anatomy, Bio, Physio). Dr. Ashish Singh: Very important because I am old students and short notes help for me. Dr. Ashish Singh: Opthal, Meds, Patho, PSM, Bio, Micro, Radio. Dr. Ashish Singh: Cool Mind, not be frustrate & attempt to all questions. Dr. Ashish Singh: OBS, Gyne. Dr.Deepshikha: Great guidance and material given by DAMS family support & god bless. Dr.Deepshikha: I have no words to explain it about my family support, they supported me in every manner. Dr.Deepshikha: My books and golden points which are provided by DAMS. Dr.Deepshikha: Kamal KV Aceross, DNB 5year. I think, must productive is Kamal KV & Across least DNB 5year. Dr.Deepshikha: Whenever I read the notes, than there were many things which, I couldn’t understand properly but when I join DAMS. I have cleared my all doubt. Dr.Deepshikha: I think Intensive study. I have read my notes & main and repeated asked topic again and again. Dr.Deepshikha: Surgery, Medicine, OBG. Opthal, PSM and short subjects too. Dr.Deepshikha: I was fully relax and confident. I have attend all 300 questions to keep up my score minimum above 150 & As you know there is no negative marketing. Dr.Deepshikha: I want to do M.S. Because I like surgery & its my parents dream. I want to do it in India. Asia in the "Education Excellence Awards-2013"
held in ITC Maurya Sheraton on 13th April. Q.89 A child with mild anemia and splenomegaly , on HPLC evaluation of Hb has absent HbA elevated HbF and elevated HbA2 .